the world, than the Mona Lisa. The story began percolating within me nearly a week ago when we visited, Motimahal restaurant in Daryaganj, New Delhi. This was a pre-diwali team lunch. The objective was to go to the real Motimahal and trace the roots of popular Tandoori cooking in India. The owner, took our order, rather we took his recommendations and ordered, butter chicken boneless, keema, brain curry and rotis and the vegetarians did a hit and trial of tandoori gobhi, daal makhni, kadhai paneer nad something else and rotis. Overall we loved our food, excellent service, 3-4 waiters to table of 10. We befriend the staff, the oldest worker for 41 years, Joshi, Ijaaz Khan 17 years and the owner Vijay Chadha..... Vijay Chadha..... Its meant to be owned by the legend and his family name should be Gujral. Thats when I decided to dig deep and find out clarity in the maze and matrix of Motimahals all over India and the world over. We all know Kundan Lal Gujral worked in a restaurant in Peshawar called Motimahal started in 1920 with the partition, he set up shop in the tony precinct of Darya Ganj in 1947 and rest is history with visits and patronage from Bulganin, Kruchchev, Gorbachov, Nixon, Kennedy, Trudeau, Zakir Hussain, Maulana Azad, Shah of Iran and most importantly, Nehru and then his daughter Indira Gandhi. Catering by Motimahal was famous at banquets and state functions even Sanjay Gandhi's wedding was catered in part or whole by them. Gujral was a rockstar among statesmen and film stars, and was often visited by Sunil Dutt, Dilip Kumar, Rajesh Khanna, Nargis even Jackie Kennedy. So then what happened, whats the problem, though I know the original genesis was in independent India, are all the Motimahal's in India part of the same group. With a comprehensive research, we find out that the biggest mistake Lala Kundan Lal Gujral made was that he did not register the trade mark and proprietary rights. The Original site at Daryaganj which was establisheed in 1947 and claims it has no branches is now owned by Vijay Chadha, who bought the tenancy rights in 1992 and also claims to be the original. Moti Mahal Deluxe Hospiatality Limited owned by Ashim Gujral has Moti Mahal Restaurants and Bar directly owned or in the franchisee model (nearly 19 of them) across India, Jammu, Chandigarh, Mumbai Bandra West and so on. The food claimed to original, however is not obsessively puratanical.They also include sizzlers, continental and other cuisine in their menu. Moti Mahal Management services Ltd, pioneered by Monish Gujral, who got immensely active in 2005 and has opened 52 restaurants primarily in malls across India with the brand name Moti Mahal Deluxe- Tandoori Trail.This group has the media's attention and share of voice. Newspapers and showhosts are eating out of his palm, without perhaps knowing the entire truth. All across nthe world from Calgary to Warsaw, Singapore, Toronto, Melboune, Chicago, several in London there is a Moti Mahal all claiming to be the real Mc Coy. The real thing with the real lineage. Great Investigative journalism stuff...i have had food at 3 Moti Mahals, namely at Vijay chadha's Darya Ganj, Malcha Marg and Saket comm complex (God know to whom does the no 2 & 3 outlets belong to) and the food was best at Darya Ganj followed by Malcha Marg & Saket. Hope you keeping doing such stories at regular intervals and give us more opportunities of visiting places with good food and service. I value your comments and have been following your stories with lot of interest. Good to read about something which invokes fond childhood memories. We had a house in daryaganj close to moti mahal and when we visited in the summer invariably would end up eating their kebabs earlier as dinner and then in my teen years as an evening snack. Moti Mahal at Darya Ganj is where AK and I plan to go next time we're looking for good Mughlai food! Thanks Samil! Sam , its strange that i have only eaten at gk 1 and malcha marg. I am totally enlightened by this research piece form you! Ofcourse its a pleasure to read your blogs on food since am a big foodie myself, but to this 'behind the scene' story makes it even better. Pls keep writing...its something that I look forward to. It's very interestig to read about the Moti Mahal article which always talks about Kundan Lal Gujral, however, if someone really dig up the reality its a bit different. There was another partner of Moti Mahal (Kundan Lal Gujral's best friend - Kundan Lal Jagi) who is still alive and living in New Friends Colong, New Delhi. He is 85 years old now and really doesn't talk much about the rest as he really doesn't care what the media says. After the partition Kundan Lal Gujral and Kundan Lal Jaggi came to India and started Moti Mahal together. They have always been best friends till the end and were equal partners of the place. If you really want to know more about Moti Mahal, please contact the real living legend of Moti Mahal who lives in New Friends Colony, New Delhi. As a matter of fact if you ever ask anyone in Daryaganj who is Kundan Lal Jaggi they all will tell you about him. If you want his address please leave me our email adress and I shall do the needful. There are a lot of stories related to the legacy of the legendary restaurant " moti mahal " but they are not all true. Once and for all,to put all souls in peace,here are the true facts of the birth of Moti Mahal. 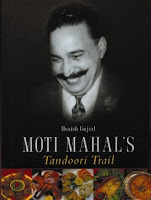 Moti Mahal was established in India after partition by three entrepreneurs namely LALA THAKUR DAS MAGO , KUNDAN LAL JAGGI AND KUNDAN LAL GUJRAL . They were all equal partners in this establishment. The fact that there is MENTION OF ONLY ONE PARTNER namely KUNDAN LAL GUJRAL,is despicably against the spirit of sportsmanship. We would like to put on record the true facts that the founders of Moti Mahal daryaganj were as named above but NOT as stated always - JUST KUNDAN LAL GUJRAL. We would really respect the mention of the names of all equal founders who were behind the creation and success of the legend that is moti mahal. Thank you Samil for sharing this wonderful article. just to add...at the time of partition, Mr Gujral came to India with his dear friend and co-worker Mr Kundan Lal Jaggi. Together, along with another gentleman Mr Thakur Das Mago, they opened this great temple of culinary delight. By the grace of God, Mr K L Jaggi is alive and healthy and staying with his family at New Friends Colony New Delhi. It will be interesting for you to speak to him and add some more interesting facts from history. I know this is half truth.. Kundan Lal Jaggi.. was co founder of Moti Mahal.. There were three partners Vade bau ji (Mr Kundal Lal Gujral) chhote Bau Ji (Kundan Lal Jaggi) and Bhapa Nath.. who was uncle of Kundan Lal Jaggi.. after few yards toward Ghoda bagh there is Building of Mr Kundal Lal Jaggi called Swarana Niwas.. Late wife of Kundal Lal Jaggi..
Kundan Lal Jaggi is still alive and the truth can be checked.. They two Kundan Lal Jaggi and Kundan Lal Gujral both were so near to each other.. I met both of them But I surprise to read all one sided story.. It is almost a sin to hide the fact.. and could not think what they achieve my hiding the fact.. I am sure even Kundan lal Gujral may not like it knowing the untruth story of Moti Mahal.. My tribute to Kundan Lal Gujral ji.. the most visionary person and most respected Kundal Lal Jaggi who is honest, hardworking and spiritual person..